Need a fun Valentine craft project for your kids (or yourself!)? Try rock valentines. They are super simple to make and involve three favorite art materials of every child I know—rocks, glue, and glitter. Seriously, how could you go wrong? 1. Gather small, smooth rocks :: wash & dry them. I prepared the rocks ahead of time so they would be ready to work with when the kids got home, but it would be a fun activity extension for them. *Note :: If you gather rocks from a wet area, such as a stream, do NOT put them in the oven as the moisture may make them explode. Squeeze a small amount of white glue into a dish. We used Elmer’s School Glue. I imagine Mod Podge would work, too. 3. Paint heart with glue. Use a fine paint brush to paint a heart on a rock with glue. Sprinkle your wet glue heart with glitter. Shake off the excess glitter from the rock. Now you can admire and share your new glitter rock valentine. Daphne had great fun making her glitter rocks. This project was inspired by our family’s love of glitter as well as the fabric heart rocks we made a couple years ago. How about you? What are your favorite Valentines for kids? Or what Valentine’s Day crafts are you up to these days? we have lots of shells saved from our last beach trip… we might try on those! those placements are super cute, too, btw! These are precious. I featured them on my blog today http://www.missloviecreations.blogspot.com/2013/01/12-sweet-handmade-valentines.html Come on over and check them out and grab a button if you like! 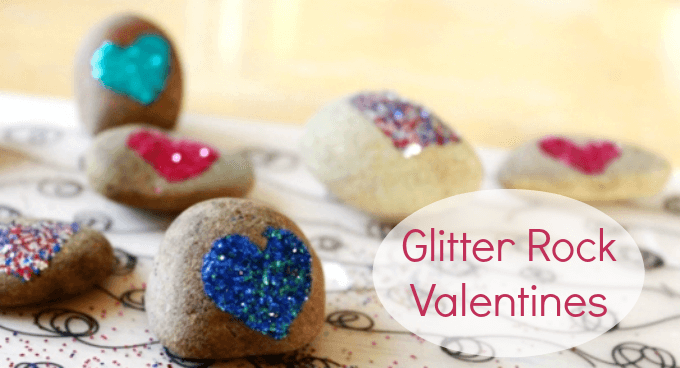 We love these glittery rocks too for a special Valentine. We featured you today on http://www.simplysprouteducate.com. We had fun making them with our own children! Thanks for sharing! These are so fun and pretty! I love glitter!! I’m a huge fan of glitter, and so are all kids I know. I think this would also be fun to do with gold paint or silver paint, or other metallics. You rock!! Rock on! Rock and roll! Rock of ages! Rock adoodle doo!